I’ve been writing a lot lately. Diversivore has touched on a lot of things of late, including a look at scratch cooking and nutrition, the fine line between intimidation and encouragement in blogging and cooking, a detailed break-down of non-traditional pesto making, and a linguistic look at peppers and Japanese food. Funny enough, all of these recipes came about as I worked on a theme dedicated to good food, prepared quickly and with no advanced preparation. Apparently simple dishes make me chatty. (Those who know me well would argue that virtually everything makes me chatty, but that’s neither here nor there). In any case, as much as I’ve enjoyed all of these recent pieces, and as much as I’ve loved the discussion and the feedback that has grown around them, I thought I’d keep things sweet and simple today, and I’m being quite literal. I love figs. I didn’t eat them when I was growing up, and I think this has a lot to do with how hard it is to transport a really good fig. They’re at their best when they’re ridiculously soft, and they don’t ripen well off the tree. That means that they’re a royal pain to transport, and they tend to be priced accordingly. Luckily, very nice green figs grow quite well here in coastal British Columbia, and I’m seeing very nice black and brown California figs showing up with a little more regularity, so I’ve been able to experiment more and more over the last few years. I adore this recipe because it’s so simple, and yet so unique. A soft, simple cheese, covered in a crisp caramel, and topped with perfect, barely cooked, wine-coloured fruit. Well, technically figs are not a fruit, but a syconium, which is a large floral receptacle lined with ovaries, each bearing tiny fruit. And they’re pollinated by tiny wasps that live inside of the fruit. And on the subject of California figs, did you know that 14,000 fig cuttings were shipped to California in the 1880s, but not a single one was able to produce fruit because the lack of fig wasps in the USA meant that the figs couldn’t get pollinated? Only when the wasps were introduced to the region did the plants begin producing fruit. Figs are weird. Ahem. I promised not to get into too much extra stuff here, but as you can see I need to avoid falling too far down any one particular rabbit hole. It’s tough because, frankly, food is fascinating. If you’ve been tagging along with me for the past few months, I’d like to think you probably agree. So thanks for reading. Now go have some dessert. This is easy, elegant, and very different from most quick desserts. It’s also pretty adaptable. I’ve given a few tips and variations here, but feel free to adjust the fruit or the dairy to whatever you like (or whatever’s in season). I’m a big fan of caramels that become crisp and candy-like as they cool, and I personally think they’re a little under-appreciated. This caramel is quite similar to the one I used in my Kumquat Apple Tart, but without butter it becomes even more brittle as it cools. This is a deliberate textural choice, as the very soft ricotta and figs need something with a bit of crunch to play against. That being said, if you want a runnier, more flowing caramel sauce, add 2 tbsp of butter to the hot sugar along with the liquid ingredients and (optionally) 1 tbsp of cream after the mixture has stopped sizzling so vigorously. If you’ve never made caramel it can seem intimidating, but it’s actually very easy. Dramatic, but easy. The two big keys to success are preparation and attentiveness. You want to have all your ingredients ready to go, as the process moves along quickly and you don’t want to be left looking for an ingredient or measuring something out. The sugar itself requires very close attention, as it cooks to a very high temperature and will quickly burn if left unattended. If the begins to burn, toss it out and start again, as it will make an unbearably bitter caramel if you continue. As for the drama element, it’s worth remembering that cooked sugar is exceptionally hot (WAY above the boiling temperature of water). This means that adding liquid to it will cause it to ‘freeze,’ crack, and bubble vigorously. As long as you’re expecting it, it’s actually pretty darned fun. Black Mission are particularly lovely and very tasty black figs, but you could use brown Turkey figs or any good fig really. While I love the way dark figs look here, I wouldn’t hesitate to use good green figs if I had them around. When choosing figs, look for extremely soft ones. Figs do not ripen well off of the tree, and firm figs will generally not develop a great deal of sweetness. If you can find really soft figs but you’re worried about whether or not they’re overripe, you can do two things. First, avoid them if they’ve got obvious crushed or brown spots. Second, give them a smell; figs spoil and get boozy smelling very quickly once they get past the ripe stage. If figs aren’t in season or you can’t get good ones, you could easily experiment with other fruits. In the spring or early summer, apricots would be an ideal choice. Pears would also work quite well, and I know they’d partner very well with the whisky caramel. If you do try a variation, let me know how it goes! I like ricotta for this because it’s simple, rustic, and light in flavour. If you’re feeling adventurous, it’s also the easiest cheese to make at home from scratch. I’ve used a standard, full-fat ricotta here, but if you like light ricotta you could make this a very light dessert overall. You can change the character of this substantially by playing with the cheese base. Mascarpone would make an amazing, elegant, and rich dessert. Quark cheese would be lovely and light, landing somewhere between mascarpone and ricotta in terms of texture. You could use whipped cream too, but I think that the heavier/thicker bases stand up to the caramel a little better. A very good quality greek yogurt sweetened with honey would also be a nice, simple option. As a final note, this is (by design) not an overly sweet dessert. If you feel that it needs a touch more sugar, add a little bit of good quality honey to the ricotta and stir it in before serving. GOOD NEWS:As desserts go, this is very light stuff. It’s relatively low in fat and calories, and high in fiber, calcium, and (interestingly enough) protein. The total amount of added brown sugar used only amounts to about 1 tbsp per person. Note that this also include full-fat ricotta, so you can substantially reduce the fat and calorie content by using a light/low-fat ricotta instead. BAD NEWS:It is still a dessert, which of course means that it’s being added on to a full meal. That being said, there’s really not a lot to get worked up about here, and (as mentioned above), you can reduce the fat and calorie content by using a light ricotta, or even a low- or no-fat Greek yogurt. Note that using mascarpone will up the fat/calorie count considerably. Halve figs and set them aside. Spread the sugar evenly in a large, heavy-bottomed pan and heat on the stovetop over medium-high heat. Once the sugar darkens and begins to melt and bubble at the edges, add the whisky, vanilla, water, and salt to the pan. The caramel should sizzle dramatically. Once it settles down a little, stir gently, and reduce the heat to a very low setting. Place the figs, cut-side down, into the caramel in the pan. Allow them to cook a little by sitting in the hot caramel for about 1 minute. Spoon portions of ricotta into individual bowls. Gently remove the figs from the pan and arrange them on the ricotta. Pour hot caramel from the pan over the figs and the ricotta. Serve immediately. Note: this type of caramel will solidify quite a bit as it cools, so don't expect a soft, goeey sauce. If you want a runnier, more flowing caramel sauce, add 2 tbsp of butter to the hot sugar along with the liquid ingredients and (optionally) 1 tbsp of cream after the mixture has stopped sizzling so vigorously. After all these months following you I still wonder how you manage to keep those recipes coming! You make me think cooking for you is like superman reading a book hahaha. I was always jealous about that :p.
Hah, well I’m not really sure myself actually. Do what you love, eh? I would be SUPER interested in a barbecued fig recipe, so don’t give up! But yeah, they’re a delicate ingredient, and they can go off a little quicker than I’d like, so I feel your pain. Good luck, and keep up the awesome cooking! Huh. This dish looks so indulgent but when you break it down it really isn’t a heavy, processed or super-sugary dessert at all. This would be a perfect ending to a dinner party, as this comes together so quickly and is on the lighter side (I mean, like for a dessert). I also had no idea figs needed to be purchased soft as they do not ripen on countertop. Thank you! I adore desserts, but I don’t tend to make too many of them because… well, I’d eat them all. But you’re absolutely right – this is a delicious treat, but it’s actually not very sugary or fatty. To be honest though, as much as I love a good dessert, I feel like too many of them are overly reliant on LOADS of fat and sugar. I prefer desserts that have some character based around a flavourful ingredient (fruit, cocoa, etc.). And you’re quite welcome for the tip – figs are one of those fruits that I think many people aren’t too smitten with simply because they haven’t been able to try good ones! I am 100% trying your caramel recipe! I’d love to serve this over coconut milk ice cream or yogurt. Yum! I really liked learning a little more about figs. It’s hard to find good ones that aren’t already rotting or super expensive here in Toronto so I tend to buy dried ones. Still delicious but totally different texture. Thanks Amanda! And yeah, it would work beautifully with either of those. And you know what, dried figs are amazing too, and they’re always going to be better than way-past-their-prime ones that languish in many a grocery store. I love what you did with two ingredients I adore: figs and ricotta! Simplicity and intense flavor at their best, thanks also to that whiskey caramel that so intrigues me. 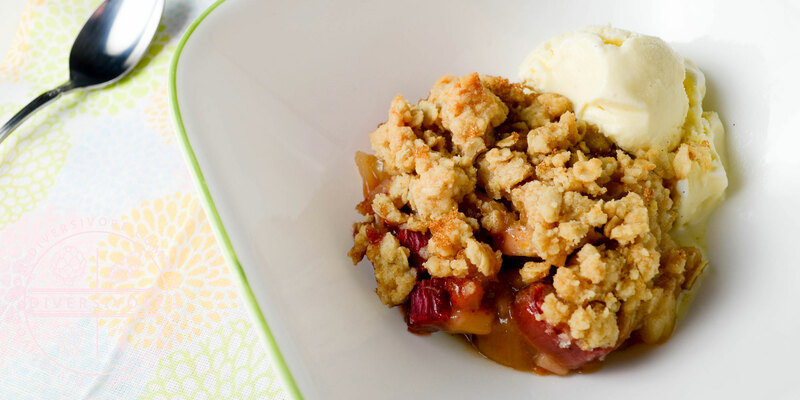 This is definitely a dessert we’re going to remake at home: easy, fast and oh so yummy. Ohhh…look at that! I have never been a fan of cheese but off late I’ve been really enjoying all sorts of brie with fruit. This recipe looks so awesome…I am totally gonna try this. Thanks for sharing! I sort of think that there’s a cheese out there for almost everyone. Ricotta is just so different from other cheeses (what with it being completely unaged and all that). And as for the pairings with fruit, I’m 100% on the same page. Glad you liked it – thanks for coming by! I just did a dish with black figs for Thanksgiving. I had no idea about the science behind them until now!!! So, thanks for that. Black figs are just about coming to an end around here and we won’t see them anymore until next summer. I do love them in savoury and sweet dishes. But you are right about buying ones that are just right. I find quite often they are overripe or hard. In any case this dish looks divine! I have never tried caramel with figs and am sure it is delicious. Another wonderful recipe. Bravo! Heh, I’m never sure if people are happy or not to learn about the science behind figs. They are… odd. But honestly, pretty much all food is weird when you really look at it. An apple is just a sugar-filled swollen tree ovary. Being a biologist kind of changes your perception of all this stuff. Haha. In any case, I’m glad you enjoyed the recipe. Thanks so much for coming by and commenting Julia! I just want to stoke the home fires and curl up to this dessert. Such a wonderful seasonal expression of fall. Sean this is speaking to my soul right now! I wanted to do something with figs this autumn but they’re so difficult to find here in Calgary and I think I’ve missed the window. If I can find some, I’m going to give this a go sans-dairy and see how it turns out. I thinking whipped coconut cream would would well! Thanks as always for the beautiful inspiration, my friend. Cheers! Whipped coconut cream would probably be AMAZING Justine. Actually, now that I think about it, I bet it’d be superb on a coconut rice pudding too, if you were so inclined. That would also cut the fatty edge from the coconut a little! I’m glad you enjoyed the post. Thanks for coming by! These are the sorts of desserts I love – light and fruity but that taste so much more decadent than they turn out to be nutritionally! Thank you Mardi! I’m soooo with you there. I mean, anyone can turn a ton of fat and sugar into a ‘treat,’ but that kind of decadence rarely tends to impress me as much desserts crafted around fruit and bold, unique flavours. These look delicious Sean! Caramel on any fruit is a winner in my books! I just recently learned how figs are pollinated ( and if you don’t know how they are pollinated , look it up I won’t spoil it for you but it’s quite fascinating! ), and I was blown away by the process. It was not at all how I imagined figs grow, as I always thought they grew like regular fruit( ie:. an apple). Oh I know… and there’s no going back! Haha! My background is in biology, and specifically in entomology, so fig wasps and their bizarrely fascinating biology are a great little information bug-folk like to have floating around to share at parties. I’m glad you enjoyed the recipe, and thanks for coming by! Hi Sean! My first time stopping by, landed on your recipe page and this one popped off the page at me! I have always been hesitant to work with figs because I just didn’t really know what to look for when choosing them at the market. You solved that problem for me today!! I am all for indulging and this is definitely going to be added to my list of “must try” desserts!